I’m lucky to live in a city full of restaurants, parks, and family friendly pubs within walking distance. Plus I’m next door to an even bigger city with even more of the same. Friday night. So many choices. One of our favorite restaurants is a leisurely stroll when there’s no ice on the sidewalks or a quick drive and a long search for parking otherwise. Our kids like the food and the pool table, we like the great happy hour specials ($2.50 taps all day until 5:30 pm), AND they offer real fruit and vegetables with the kids meals (apple sauce and baby carrots). I’ve written about them a number of times already — they take advantage of any event be it snow, helping out fellow hospitality workers or simply casting a ballot. Curious about what’s literally on Tap? Just like them on Facebook or follow them on Twitter and you’ll hear about every keg tapped. But it’s popular. It’s so popular that even on a regular old Tuesday night, you might have to wait 20 minutes for a table. So don’t even think about going on Friday night during Lent for their Fish Fry. On the other hand, O’Gara’s has open tables. 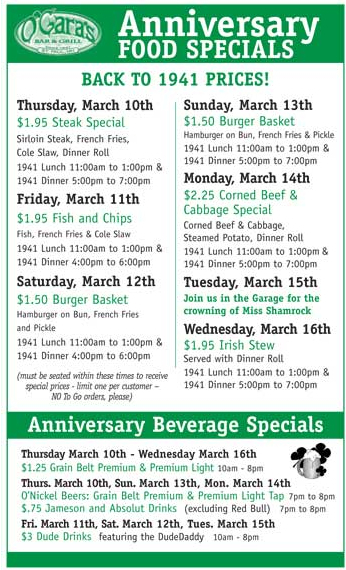 March 10 – 16th they’re celebrating 75 years as a family run business with 1941 meal specials. $1.95 for a Friday night fish and chips. $1.50 for a Saturday and Sunday burger baskets. And we walked right in at 5:30 pm and we’re able to pick which table we wanted. Granted, the burger basket is nothing like the Juicy Lucys at the Tap, but still, who doesn’t like a deal? Now, I’m trying to figure out how I knew about the Anniversary Food Specials. It wasn’t on Facebook. It wasn’t on Twitter (they don’t have a Twitter feed). I think I must have seen it perusing the paper copies of Vita.MN or City Pages this week, but I can’t remember. Some ad must have caught my eye because it made me go to their website when I couldn’t figure out what to make for dinner (it was too warm for Cassoulet, after all). So why is the ‘Tap packed and O’Gara’s not? It’s actually a complicated answer. You can’t just say it’s because the Groveland Tap fully utilizes social media and O’Gara’s randomly updates their Facebook page. The Tap is tiny and young (less than 20 years old) where as O’Gara’s is an old school Irish pub with a long history serving their community. They serve different target markets. When I walk into the ‘Tap, I see a lot of young families and urban professionals. At O’Gara’s I’ll see everyone from music lovers and college students decked out in green to not-so-recent retirees. Plus all the sports fans who take the Shamrock Shuttle to local events. The food at both places is your standard bar food with lots of fried appetizers and burgers. 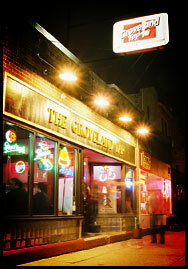 The Groveland Tap has one of the best tap beer lists in Minneapolis-St. Paul and happy hour pricing. O’Gara’s serves your standard Irish brews and your find-everywhere American ones. Grainbelt Premium for a nickel from 7-8 pm on Sunday, March 12th. The brewpub and its gorgeous copper mash tun are history. However, O’Gara’s has the luck of the Irish. They’re on a really busy corner where 30,000 cars pass by everyday. They’ve got a huge parking lot by city standards. And nothing is more important in real estate than location, location, and location. The ‘Tap, while not too far from a fairly busy intersection is not something you just happen to drive by. It’s a destination spot. The Groveland Tap needs to tell the world “Here We Are! Come Visit Us!” O’Gara’s just needs to open the door.